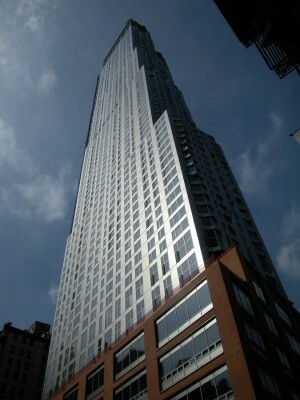 Developed by Forest City Ratner Companies (FCRC), New York by Gehry at 8 Spruce Street is the first residential tower designed in New York City by world-renowned architect Frank Gehry. Located at 8 Spruce Street in Lower Manhattan, New York City, NY (USA) this mixed-use building is a 1.1 million-square-foot, 76-story high-rise that includes 899 luxury rental apartments, a 4-story 100,000 square feet public school, a 21,000-square-foot ambulatory care center for New York Downtown Hospital, and 26,000 square feet of parking for 175 cars for hospital use. 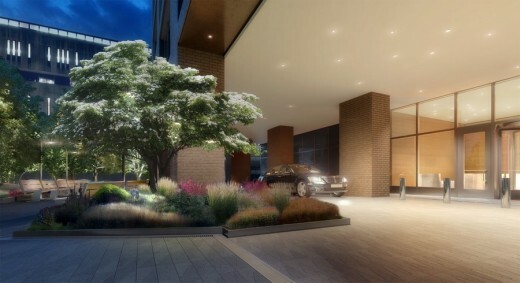 The site also includes two beautifully landscaped public plazas totaling 15,000 square feet designed by Field Operations and Dutch planting designer Piet Oudolf and is the tallest residential building ever completed in the City. “My goal is to create an elegant residential tower, one that speaks to the surrounding towers but also creates its own architectural identity. This is a building that could only be built in New York.” said Mr. Gehry, upon the building’s opening to great acclaim in 2011. 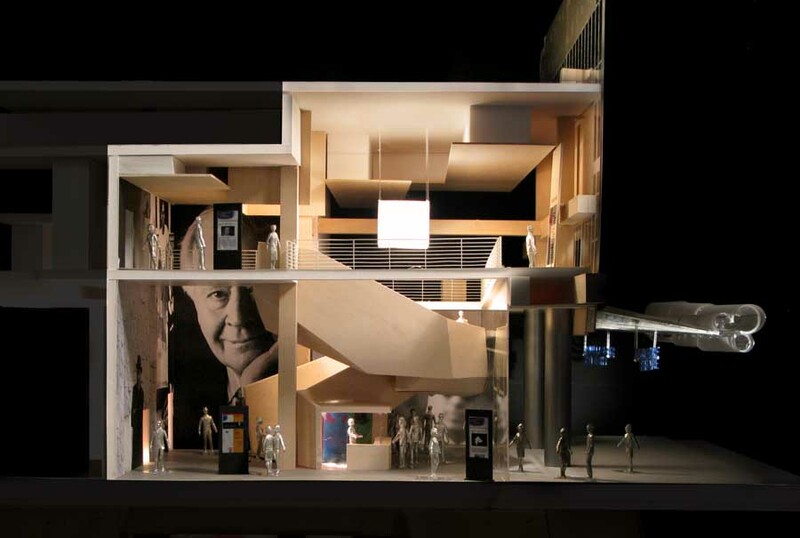 In designing the building, Mr. Gehry, along with the design team, began by mapping the complex surface geometry of the curtain wall with a computer software program developed by Gehry Technologies called Digital Project. 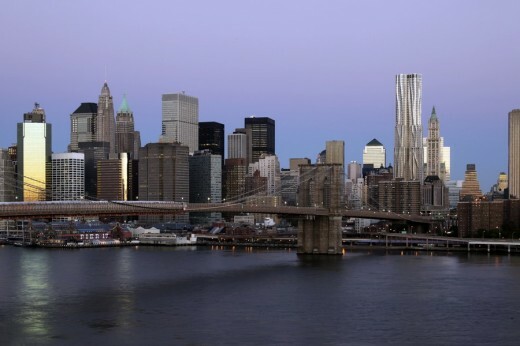 The wall, which is made from a similar stainless steel skin as the Chrysler Building in Manhattan, achieves a stunning effect of reflecting colors from the surrounding neighboring buildings and the East River. From outside, the building has the iconic asymmetrical look of a Frank Gehry building with curvaceous folds, which resemble the folds in a piece of gently draped fabric, inspired by the classical draping of 17th Century Italian sculptor Gianlorenzo Bernini. Even from a distance in neighboring Brooklyn the building’s curves stand out amongst the Lower Manhattan skyline. The iconic stainless steel-wrapped residential structure sits on top of a terracotta-colored brick podium. This podium serves as a pedestal for the sculptural tower and houses a local public school, doctors’ offices, residential lobby, and a small retail space. Residents are able to enjoy an enclosed swimming pool, a yoga & pilates studio, and a TV screening room. Families looking to barbecue can take advantage of the grills and private cabanas at the Grill Terrace, or parents bring their kids to the Children’s Playroom or Tween’s Den. People inquisitive about cooking can explore the Chef’s demonstration and catering kitchen, while golfers who want to test their skills can practice on one of the state of the art golf simulators, all of which are located on the 6th,7th, and 8th-floor levels. The interior of the building reflects the quality and prestige of the exterior. Curvy furniture, modern appliances, and open spaces define the inside of the building. Even the door handles in the building were designed by Mr. Gehry, demonstrating the amount of detail he wanted this building to have. Mr. Gehry designed all of the building’s finishes, including the amenities such as the screening room and grilling terrace which are ideal spots for families living in the building to play, dine and relax together. 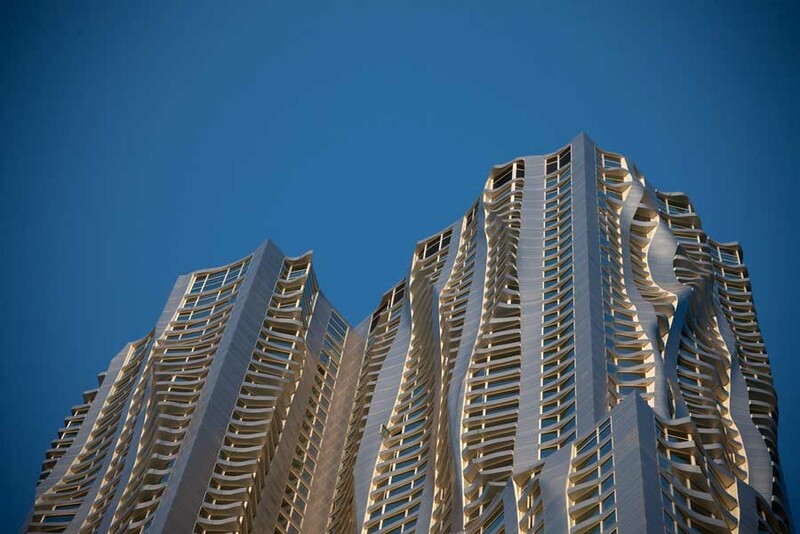 Not surprisingly, because of the building’s location in such a thriving neighborhood, its quality services and luxury aesthetic, and the fact that it was designed by world renowned architect Frank Gehry, the residences filled up extremely quickly. The residences benefit from the unique design that provides panoramic views from all 899 rental units. 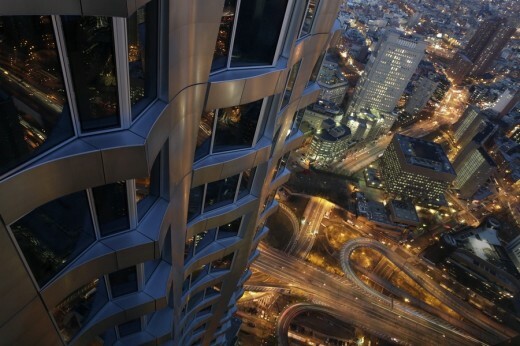 Due to the intricate design of the building’s curtain wall, each floor of the tower has a different configuration. The result is that each apartment has a unique shape where it connects with the exterior façade, giving tenants the satisfaction of knowing that there is no apartment exactly like their own in the building. One-bedroom apartments in the building appear larger due to the design of the windows and natural light that comes through in every apartment. The building sits in the heart of the New York Financial District in lower Manhattan for which the building has been a catalyst making the neighborhood a residential destination, and remains the epitome of luxurious lifestyle for individuals and families. Now the most recognizable tower in the area, many young couples as well as “empty-nesters” are flocking to the building to take advantage of the buildings one bedroom units in this iconic building. 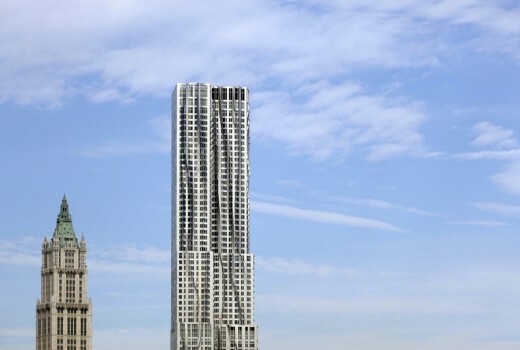 With all the included amenities and services, great views, proximity to work and the great restaurants in the area, the New York by Gehry building is a unique tower that celebrates and reflects the vibrant Manhattan culture while continually going above and beyond expectations.